Defiance kind of came out of nowhere for us, a game that plays like an MMO but doesn't feature MMO monthly fees. Available on Xbox 360, PlayStation 3, and PC - Defiance puts players in the role of an Ark Hunter. Set in a futuristic Earth, the game shares a story with a TV show of the same name, and events seen in both the game and the TV show will affect each other - at least - that's what we're told. But what exactly is an Ark Hunter? And how did this all begin? Ark Hunters are specialists at salvage. Valuable alien minerals and technology scattered by the orbital destruction of the Votan planetary arks now encircles the earth in the Ark Belt. This debris occasionally rains down in dangerous events called arkfalls. Ark Hunters must fight off other competition both human and alien if they wish to claim the rare minerals and Arktech from the heart of an arkfall for their own. The life of an Ark Hunter is exciting, dangerous and profitable … while it lasts. To further the story of Ark Hunters, there's a short animated series that will be released on the web to tell the history of the Ark Hunters. The first trailer for that is available now. 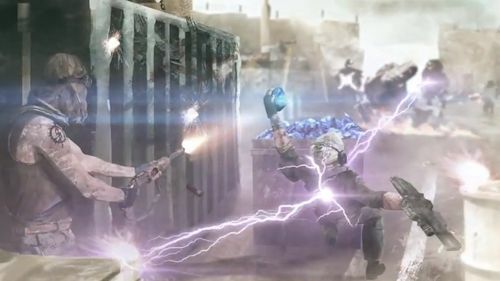 Along with Defiance's story based singleplayer / co-op missions, is a competitive multiplayer mode as well. There's a new trailer available for that which you can see below. Defiance is set to release on April 2nd on all platforms. Page created in 0.4144 seconds.